For small items and individual wrapping for candies and other small items, the TTDF offers a simple, easy to use, inexpensive wrapping process. 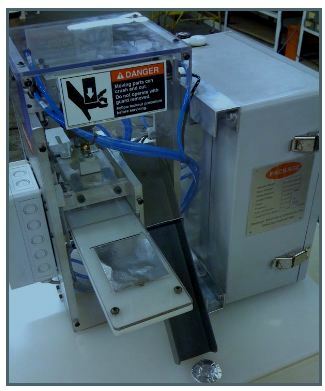 The TTDF 1 and 2 offer opportunities to automate the wrapping of baked goods, candy bars and other products. The sealing goes on the bottom. This makes it easy to accommodate products that do not have flat or rigid sides or are too short for side sealing. Round or rectangular products can be wrapped on the TTDF. The TTDF cycles up to 15+ strokes per minute. Throughput depends on operator. Easy operation by entry-level operators makes it possible to spend valuable time on higher level requirements. Low acquisition, operation & maintenance costs render the TTDF desirable to anyone interested in venturing into attractive wrapping without significant financial risk. *All specifications subject to change. Maximum product throughput will vary depending on package dimensions and operator. **Package Machinery Company Inc. reserves the right to modify any and all of the following listed features, specifications, and option packages.